For Ralph Boyd Johnson's next album, it seems to be all about past inspirations. The title "1723 9th Street SW" is also the address of a historic house he once lived in, with whom he considers his biggest influence, Billy Cowsill. Billy knew fame at a young age; playing guitar with his family band The Cowsills. The band saw success with hits such as "Hair," the title song to the 1968 musical Hair, as well as the 1979 film version of the musical, and "Indian Lake." TV's "The Partridge Family" was based on The Cowsills. It wasn't long before Billy grew out of the family-friendly pop music scene and moved to Vancouver in the 1980's to front the band The Blue Shadows. Billy then made his way to Calgary, and that is where Ralph and Billy met. Sharing the red brick house built with separate apartments were other musicians, including blues player Back Alley John, "Powder Blues" drummer Duris Maxwell, and Mickey Joy, who played bass for early punk bands. Johnson acknowledged he was surrounded by "very influential, brilliant players." He tells of the atmosphere that the oversized house held, with the sound of Billy practicing guitar encompassing the hardwood floors and slat walls. Ralph expressed that Billy was "like a father," and when the 58 year old succumbed to his ailments, including emphysema and Cushing syndrome in 2006, it was a rough time. Johnson said he didn't write or play much for about 18 months after Billy's death. The vintage house that Billy had lived and died in was then destined to be bulldozed. One day Ralph was at the home, retrieving the antique door from the front entrance to give to a friend. While leaving the residence, he bumped into an older gentleman. The two talked about the history of the house, and the man introduced himself as the President of the Heritage Society. The house was soon after designated as a heritage site, and $350,000 was invested to fix it up, said Johnson. The country/blues/roots artist eventually got back into his music. Johnson writes his own material, plays guitar and harmonica, and sings. Ralph has been active in the Calgary music scene for years, playing venues across the city. He was urged to have his music recorded, and in 2002, he came out with his first CD, "Dying to Go." He is currently working with Jan Arden's former manager, and after four years in the making, his second album is destined for release late this summer. Coincidentally, "1723 9th Street SW" will drop at a special time as September 2011 will mark the 100th Anniversary of the monumental home. 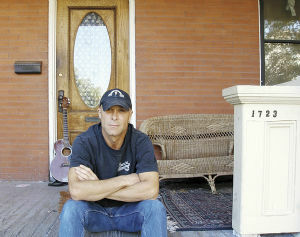 Recorded at MCI and Airwave Studios in Calgary, the disc is dedicated to Billy, or as Johnson calls him, "Wild Billy C," which is also a song on "1723 9th Street SW." He plans to tour Canada and Europe, with emphasis on Alberta, because Johnson says, "80 per cent of the roots music is here in Alberta." In that vein, Ralph described his record and his work in his own words, and stated that it's like magic. "Music is all about heart - it isn't about anything other than vibration and connecting."